The Irish have a way with music that never fails to touch one's heart. I come from Canada and if I am truly honest I know of no Irish blood that flows through my veins. Still here as through-out North America, The Irish have left their mark and for all I know there may well be a trace of Irish in me as well, for like the Scotch, the Irish played a major roll in colonizing this land. Perhaps they came later, but they came in droves and in the mixing pot of culture they have played a part greater than their numbers might suggest. When I hear this old Irish ballad, I feel my heart rise in my throat. Perhaps it has the same effect upon you. It's an old song, no doubt, and some might think it somewhat out of touch, but in a world where you'd think we'd have out grown war by now, still we send the best of our youth to far away lands to fight and die for someone else's cause. If it isn't Europe, it's Asia, and if not there its Africa and if not Africa, its the Middle East. It seems that there is always someone who wants us to lay down our corpses to settle their unrest. I'll bet that Canada is one of the few countries that has shed more of it's blood fighting in other lands than fighting for its own. All we want is peace, and all everybody wants from us is war. And so they send us, once more, into the breach to defend, what is supposed to be the good cause. What does it accomplish besides leaving behind men beneath the sod? When will these people realize that nobody wins in war? The Irish knew this, even though they sent many of their finest to fight and die in defense of the British Empire. In the end they found themselves caught up in a quagmire of war that nearly destroyed them. But if the Irish could find peace, then surely there is hope for all of us yet. All we have to do is stop, just long enough to look around and see the madness that war is. 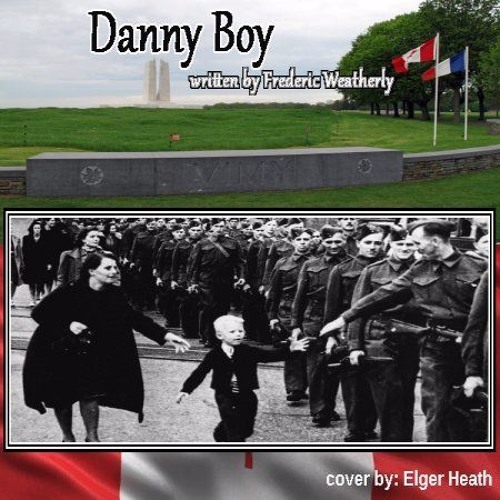 'Danny Boy', written by Frederic Weatherly, was written to an old Irish tune called “Londonderry Air” and is a traditional Irish standard that is sometimes seen as an unofficial Irish anthem. That aside it is a very nice ballad that speaks of the costs of war and the depths of love. Here is a cover version I recorded today, when I felt the need to play a tune on my guitar.